Fence Workshop™ of Orlando is recognized as a top supplier of steel fences throughout Orlando, Florida and surrounding areas. Our goal is to be the most respected and trusted fence company in the area, which we maintain by giving our customers top service and supplies. Our options in steel fencing are virtually endless and our passion for fences is apparent in every fence we build. Our steel fences are much stronger than aluminum fencing but not recommended to be used in coastal areas (25 miles from the ocean). 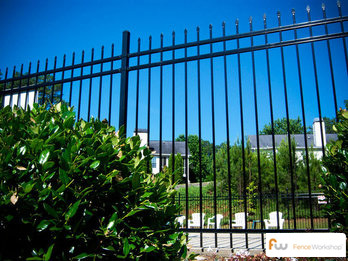 Orlando has many different fencing needs, from security to privacy. 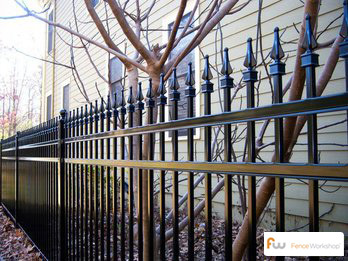 A steel fence is a great way to protect your home or property whether you live or work in the lively downtown area or retreat to one of the many beautiful neighborhoods surrounding Orlando. We aim to maintain the unique personality and charm of the area with every steel fence we install. Why choose Fence Workshop™ for steel fencing in Orlando, Florida? We supply all styles of steel fences in Orlando. We supply steel fence additions like scrolls, rings, ball caps and gates. Our steel fences are much stronger than comparable aluminum fences. We’re a leading Orlando fence company that supplies steel fences in Orlando, FL and surrounding areas like Tampa, Jacksonville, Destin, Daytona Beach and more. Chain Link Fences In Orlando, FL. Farm Fences In Orlando, FL. Aluminum Fences In Orlando, FL. Wood Fences In Orlando, FL. Vinyl Fences In Orlando, FL. Home Fences In Orlando, FL.